The 1913 T200 Fatima baseball teams set consists of 16 unnumbered photos that and are 2-5/8" by 4-3/4" in size. The set consists of each of the major league teams and is printed on thin photo paper with black borders. The last name of each player is listed on the front of each of the T200 Fatima Team photos. The cards can be easily identified by the Fatima advertisement on the back, the phrase "No gold tips but finest quality", and the special offer for the premium cards. 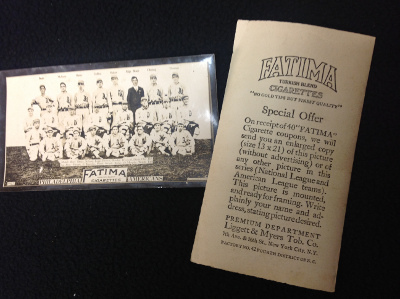 CLICK HERE if you want to sell your 1913 T200 Fatima Teams Baseball Cards.